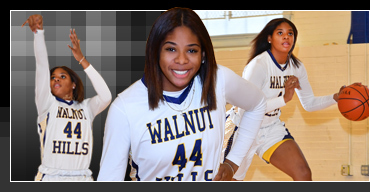 GREATEST ACHIEVEMENT: Scholarship to Miami U.
Walnut Hills' senior power forward/center Kennedi Myles had a star-studded prep career at Walnut Hills High School. Kennedi led the high-flying Lady Eagles to an outstanding 25-2 record this season, capturing a third straight ECC championship with an undefeated 14-0 record in league play. The team was also sectional and district champs, finishing as regional semifinalists. A four-year varsity starter, Kennedi is a member of the 1,000+ point club and notched a remarkable 15 double-double games this season, averaging 14 points and a league-leading 11 rebounds per game. She finished with 40 double-double games in her great career. Big games this season included games vs. Turpin (23 points-12 rebounds), Huber Heights Wayne (21 points-10 rebounds), Middletown (19 points-11 rebounds) and Seton (19 points-12 rebounds). So far this year, Kennedi's honors include being named 1st team all-ECC for the third time and 3rd team all-SWO District. Twice Kennedi has been named ECC Player of the Year. A member of the Student Athlete Leadership Team, Kennedi will play basketball collegiately at Miami University in Oxford. Her favorite athlete is Draymond Green, favorite entertainer is iamzoie, favorite book is Copper Sun, favorite movie is Mahida and most-like-to-meet is Idris Elba. COACH'S QUOTE – "Kennedi is a tremendous leader, an exceptionally skilled player and an immensely hard worker. Most importantly, she is a winner!"